Update 2 Nov 2017: Now in paperback. In 1938 Britain started to quiz. Since then, quizzes have become ubiquitous entertainment from pubs to primetime, suffered major criminal investigations, created unlikely folk heroes and been subjected to the rigours of question checkers. 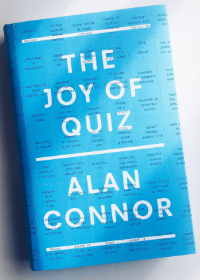 The Joy of Quiz tells the history of quiz and its makers, wonders how we came to make a game out of remembering scraps of information, looks at the tactics of professional quizzers and reveals the shadowy worlds of setters and checkers. 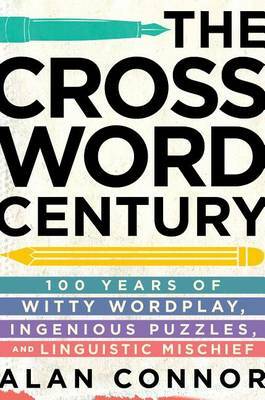 My book about the fun of crosswords, The Crossword Century: 100 Years of Witty Wordplay, Ingenious Puzzles, and Linguistic Mischief, has been published by Gotham. It is available at your local bookshop, or at IndieBound, Amazon, Barnes & Noble, Powell’s, Books-A-Million, The Book Depository, iTunes, and so on. 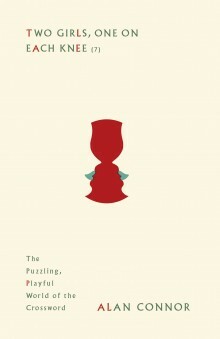 And… it contains a puzzle by Brendan Emmett Quigley. 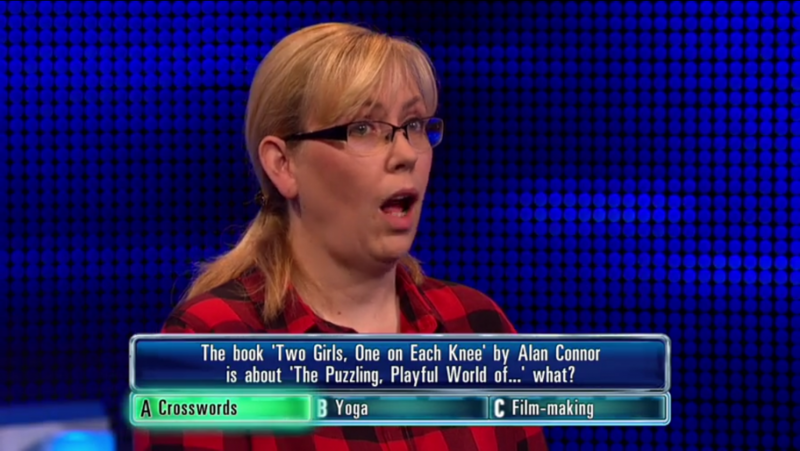 My book about crosswords, Two Girls, One on Each Knee, is out today as a paperback. 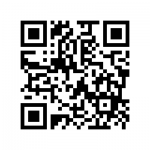 Reviews, etc: Sunday Times; Mail on Sunday; Spectator; Telegraph; Scotsman; Financial Times; Metro; Times; Herald; Globe & Mail. Hear me: on The Verb and on Weekend. • How have crosswords helped international relations, caused a strike by welders, become embroiled with espionage and even caused a moral panic? 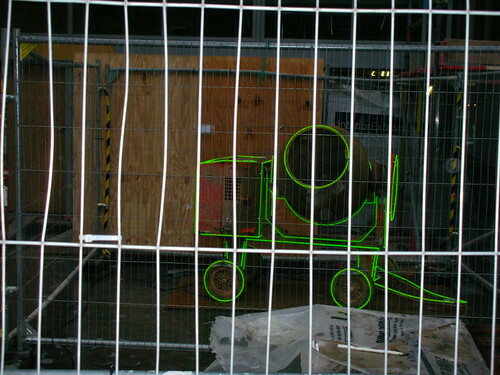 • What have Frank Sinatra, P. G. Wodehouse and Stephen Sondheim got to do with the humble grid? 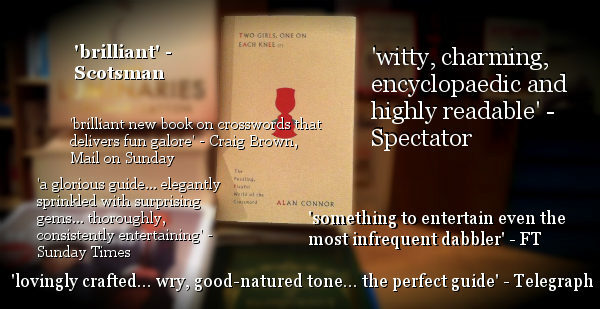 • What connects Bletchley Park and the Daily Telegraph? • Which famous fan starts each day with the Telegraph crossword and kippers? 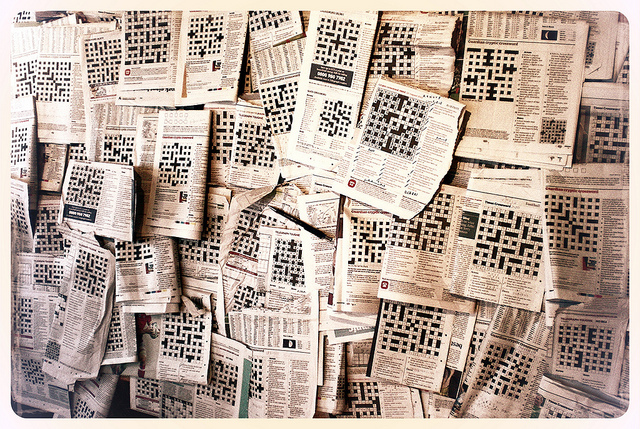 On 21 December 2013, the crossword puzzle will be 100 years old. In the century since its birth, it has evolved into the world’s most popular intellectual pastime. 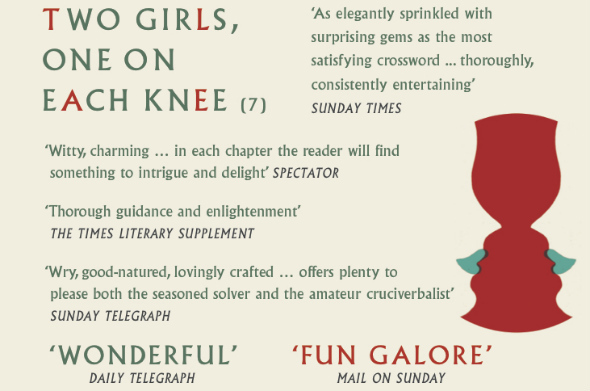 In Two Girls, One on Each Knee, Alan Connor celebrates the wit, ingenuity and frustration of this addictive sport and how it has grown. The story of the crossword takes us from the beaches of D-Day to the banks of the river Neva, via Fleet Street and the Old Bailey. It involves the most fiendish setters, such as Torquemada and Ximenes; famous fans (both real and imaginary) from P. G. Wodehouse to Frank Sinatra, Inspector Morse to Reggie Perrin. 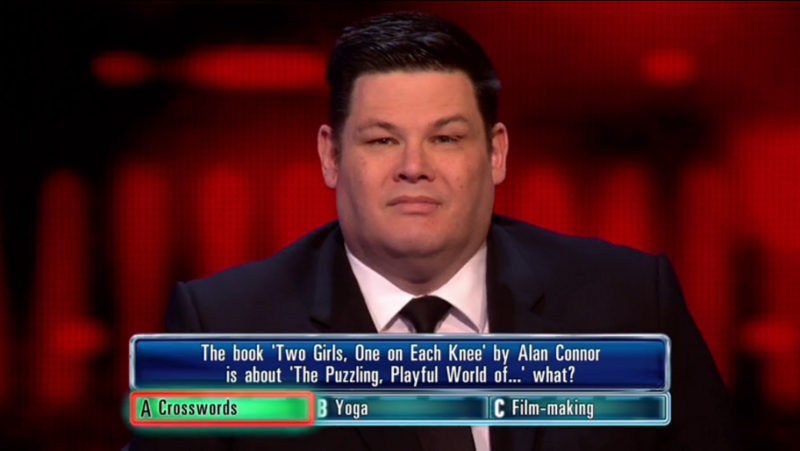 You’ll discover how crosswords have featured in films such as Brief Encounter and songs by Madness and Ian Dury; how they intersect with espionage, jokes, class and morality; and how they reflect back how our language and behaviour has changed over the last century. You’ll also discover how listening to white noise can help you do a crossword, why you should start in the bottom right-hand corner, and why cryptic crosswords are actually easier than quick (honestly). This is a book about language and how it speaks to itself, twisting and transforming through cryptic clues before resolving itself, with a bit of luck, into an answer. Where else would you find words such as Intussuscept, Obtemperate, Zibet and Raisiny? 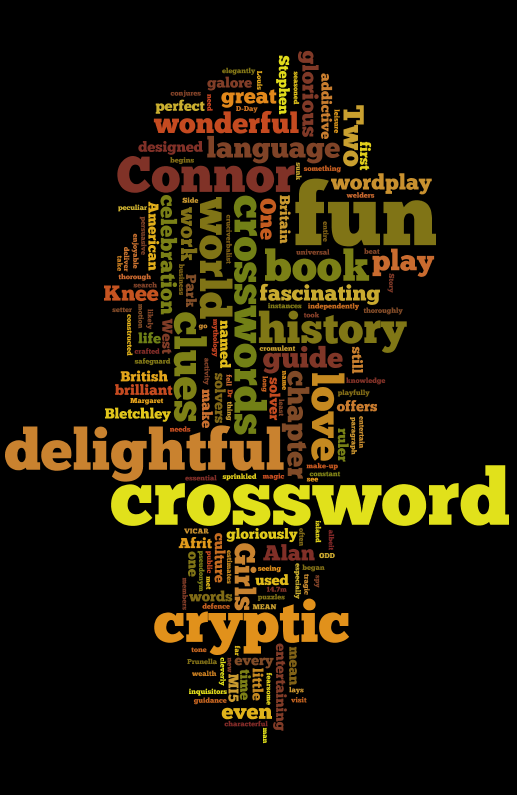 My book about the crossword, Two Girls, One On Each Knee (7), has a publication date of 7 November 2013. See me at the ICA this week as part of Modern Art in 3,600 Seconds, where Will Gompertz will read from his book What Are You Looking At? and introduce guests including Prof Anne Massey, ICA boss Gregor Muir and artist David Batchelor.